Our olive oil dough is a bit richer than the master recipe, and this also adds some good flavor to the flatbread (and, is also delicious in focaccia bread as well). ‘Shaving’ the asparagus take a bit of time, but the end results are worth it: there is no worry of biting into an undercooked piece of asparagus. Also, this should work well on the grill, if you’d like to move things outside (I use a Weber grill). And, on a side note, if you don’t have a pizza peel, a large cookie sheet with 3 sides works well, too! 1/2 pound olive oil dough, from Artisan Pizza and Flatbread in Five Minutes A Day —page 61 (a similar dough appears in our 1st book, or use any of our basic doughs, like white, or whole grain). As mentioned above, you could also try this on the grill, with posts to reference here and here. Chive flowers (optional) Note: chive flowers have a very strong onion taste, so they may not be for everyone! Preheat your oven as high as it can go (500 degrees or more), with a pizza stone near the bottom. Roll dough into an oval about 1/8 inch thick right on a pizza peel. Spread the onion spread evenly over the top, leaving a 1-inch border. Add the asparagus evenly over the onion spread. Sprinkle with goat cheese. Check for good movement on the pizza peel, and if there’s not, use a dough scraper to get some flour (or cornmeal) underneath it. Then quickly slide the flatbread onto the preheated pizza stone. Let the flatbread bake for 8-10 minutes. This recipe makes enough for two pizzas. Heat the olive oil and butter in a medium skillet over medium heat. Then, add the onion, and follow Zoe’s instructions for caramelizing onions. When the onions are finished cooking, set aside to cool. After they have cooled, add them to a food processor with the sour cream or yogurt, and pulse until the onions are broken down, but the spread still has some texture. Add salt and pepper to taste, if desired. I keep wanting to make pizza and this makes it sound so super easy. Can’t wait to try it with all the fresh asparagus at the farmer’s market. The link to Zoe’s recipe for how to caramelize onions doesn’t seem to be working. I am still loving trying all your different bread recipes. Maybe this will be the first flatbread I try! I think I’ve fixed the link to the onions. Let me know if it is still giving you problems. In California you are so lucky to have almost everything growing at your door. I’m not sure what is coming up now, but shaved artichoke hearts come to mind. Let me know what you come up with. I made this last night and the carmelized onion spread made with sour cream is wonderful! 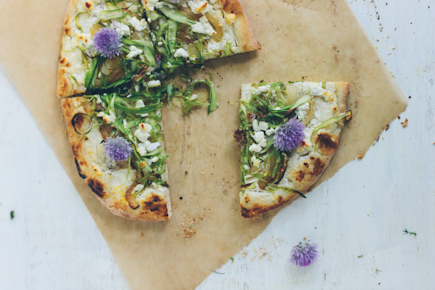 I have often made pizzas with goat cheese and found them too dry. 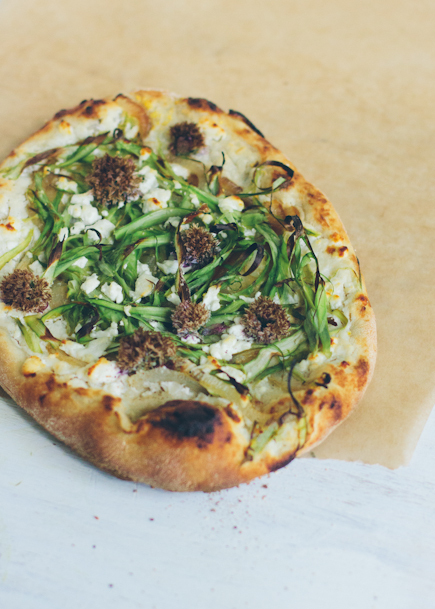 I added some buttermilk and sour cream to the carmelized onions, whizzed them in my speedy Bullet blender and spread them on the dough, added asparagus and some chive flowers which I have in my yard, and the resulting baked pizza was amazing! Very tasty and different. Excellent! Thank you so much for trying the recipe and taking the time to let us know you liked it! 🙂 I love your additions! Any info on using a steam oven. Williams-Sonoma has one I am interested in…by Cuisinart. No baking stone…..need suggestions please. Love your bread! I have used professional ovens that have steam injectors and the results are wonderful. It is just an internal way to get the steam into the oven when baking bread. I haven’t ever tried the Cuisinart brand, but I do like the concept. Yes, we have many readers who substitute almond or rice milk in our recipes. We’ve also had great luck baking with Earth Balance or other butter substitutes. My family LOVES your pizza crust. I love the whole wheat version because it’s super easy to roll out. For my daughter’s second birthday this Friday, we’re having 7 two-year-olds over (with their parents) for dinner. I decided to use your pizza crust and make mini pizza crusts that they can top with whatever we find at the farmer’s market that week. I’m excited to recommend this “adult-version” for the parents. My question is, I was going to par-bake the crusts ahead of time and freeze them until the party. Any suggestions or experience with doing that? Do you have our pizza book? If so, you will find instruction for freezing parbaked crusts on page 51. Let me know if you don’t have it! Ha! I do! I never even considered looking there. Thanks, I’ll check it out. That’s terrific, let me know if you have any questions after you check it out! How should I incorporate quinoa into bread recipes. Do you have our Healthy Bread book? If so, there is a recipe on page 132 for a quinoa bread. Yes I do, should have looked. Oh, the recipe says 1 cup uncooked quiona. Is that correct? Yes, that is right, does it strike you as odd? No, just wanted to make sure. Thanks, and have a good 4th. Enjoy your holiday and the bread! I’ve been baking our bread at home using your method for a few weeks now, and I’m completely sold! This is the first time I’ve been able to actually stick to baking our bread because never before has it been this easy and practical on a day-to-day level. Thank you! I do have one question, though–while homemade bread is undeniably less expensive than store-bought, I’m still spending more money than I’d like to on flour. I splurge on Hodgson Mill and King Arthur flours, partly because I like to use white whole-wheat flour in place of plain white flour. Do you or your readers know of any good sources where I could purchase these flours in bulk, or any sources that sell them for a particularly good price? Sara: Unfortunately I don’t know of bulk sources for these, it’s still a niche product and until it becomes widespread we won’t see bulk sources. Anyone else? Just wanted to give a quick update–I found 5-pound bags of white whole-wheat flour at my local Trader Joe’s for $2.99. The next-best price I found (from the discount grocery near us) was $4.99 for the same price, so Trader Joe’s is where I’ll be getting my flour for the foreseeable future! Sorry, that should read $4.99 for the same SIZE. Hello, I recently found a 00 flour in my local Shop Rite. The brand is Anna Napoletana. The label says TIPO “00.” Is this the low protein flour that can be used in your Ultimate Tender Neapolitan Crust? I have never seen this flour in the store before so maybe it is something new they are carrying. it is sold in 2.2 lb. bags. Thanks for the info! Love your books! Yep, that’s the stuff, let us know how it works in the recipe. It’s great that Shop Rite’s carrying this kind of product. Also, beware of a problem on a nearby recipe, on page 72, there’s a typo. It should be 3 3/4 cups of water. Not 4 3/4. I tried the Anna Napoletana flour I found at Shop Rite. It worked out great! The crust of the pizza was nice and chewy. Thanks for the info on the typo on page 72. I have another question about the recipe on page 238 of Healthy Bread. It calls for 3.5 cups of cornstarch. Is that correct? I’m looking forward to your new book. I love the ingredient weights and am happy to see more gluten free recipes! The 3.5 cups cornstarch is correct, but we find you can substitute some or all of it with Tapioca flour. Basically, you can do it. Either freeze as rolled-out raw rounds of down, or yes, parbake (don’t go very far) and then freeze. Thank you for the lovely note, I am so glad you are enjoying the olive oil dough! I love the addition of freshly ground whole wheat. Hi, I have made a number of recipes from the new artisan bread in 5 book. Just made this olive oil dough and it doesn’t seem as wet as the others. Is this intended to be more dry? Or am I getting something wrong? Hi. It may also be due to the dry air of winter, depending where you live. The olive oil dough is not noticeably drier than the master. If you find it to be, you can add a tablespoon or two more water.